Preliminary numbers released by organizers of this year’s BookExpo and BookCon show a ‘reimagined’ focus on booksellers that may actually have drawn fewer booksellers and retailers than last year. 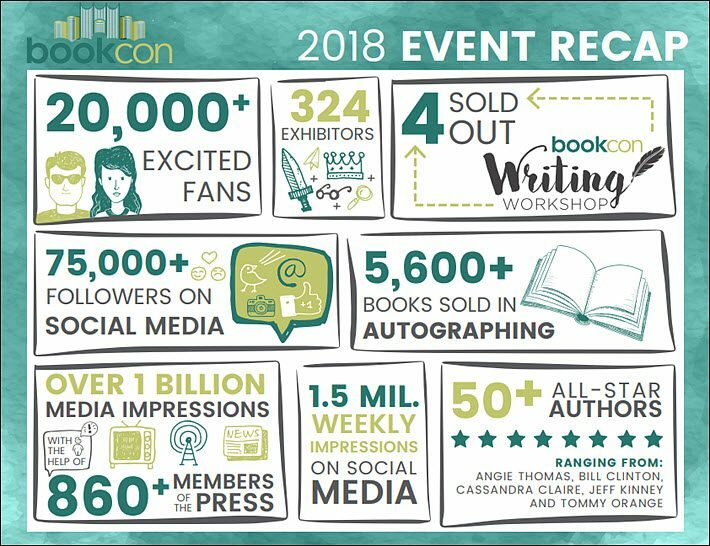 In its release today (June 20) of the preliminary attendance figures for BookExpo 2018 and BookCon, the organizers at Reed Exhibitions cite 7,732 attendees, including members of the press but not including the consumer-oriented BookCon, as the total headcount for BookExpo, compared to last year’s 7,425. The trade show has provided its numbers in the form of an upbeat infographic that indicates that 54 percent of the overall attendance was at BookExpo for the first time. At first blush, that might sound great. But a moment of thought makes you remember that BookExpo is an annual trade event, a true fixture of the American book publishing industry that’s been in place for decades. If more than half your crowd is new—and if your year-to-year numbers go from 7,425 to 7,732, it means that a lot of people aren’t coming back: are longtime regulars disappearing? On the other hand, that notion is unsurprising to anyone who has been going to BookExpo (formerly BookExpo America) for many years and watched as the exhibitor-space footprint has been shrinking relentlessly. As we’ve mentioned in earlier writings, the southern quarter or so of the floor at the Javits—once the site of towering Big Five stands—was empty this year except for lines of author-autograph seekers. The company is reporting that there were 473 exhibitors on the reduced floor of the show. Last year’s double-wide aisles seemed narrower this time, which may have contributed to the sensation of walking through a more crowded show. Is It Possible That Fewer Booksellers Were There? 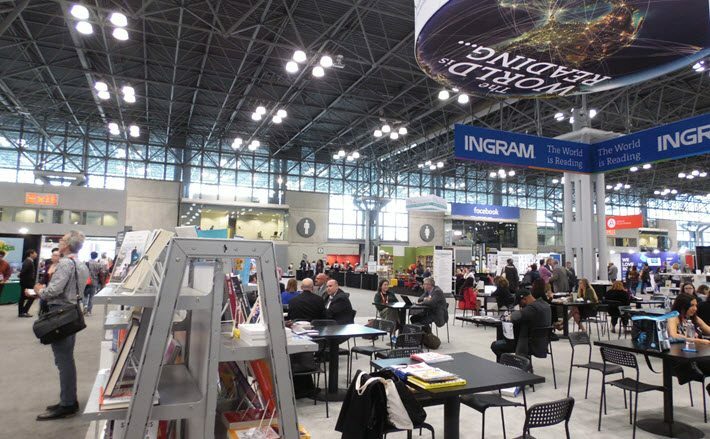 As Publishing Perspectives readers know, the show—which ran May 30 to June 1 at the Javits Center in New York City—made a major effort this year to emphasize booksellers and to attract them with special chances to meet one-on-one with publishers’ editors and others. There was a strong cooperative effort with the American Booksellers Association, recognized by ABA chief Oren Teicher during the association’s annual meeting. 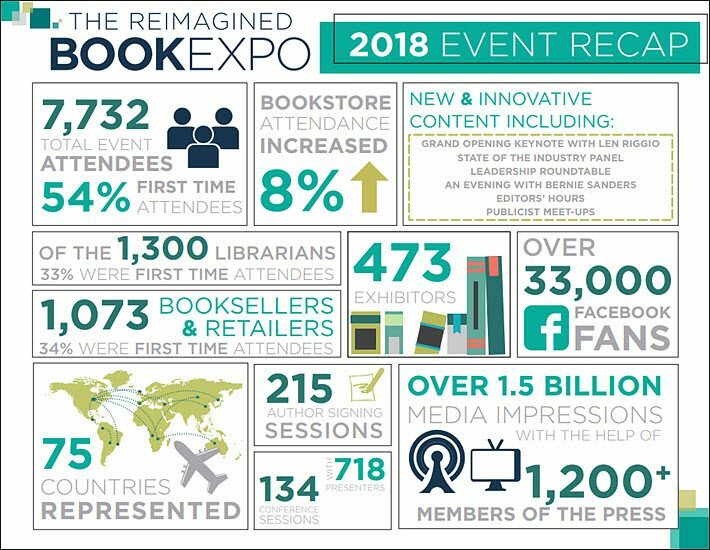 And terming this its “reimagined” approach, the BookExpo team says it saw an increase in bookstore representatives’ attendance of 8 percent—a turnout of 1,073 booksellers and retailers. But Michael Cader at Publishers Lunch is reporting that last year’s bookseller-and-retail headcount was actually higher, at 1,289. The company says, 34 percent of the bookselling contingent were first-time attendees. If this results in more orders for books from the stores, then a 34-percent increase is encouraging. But that doesn’t get us past the fact that all the emphasis on those important bookshop staffers may actually have ended up with an embarrassing sag in that category’s attendance. 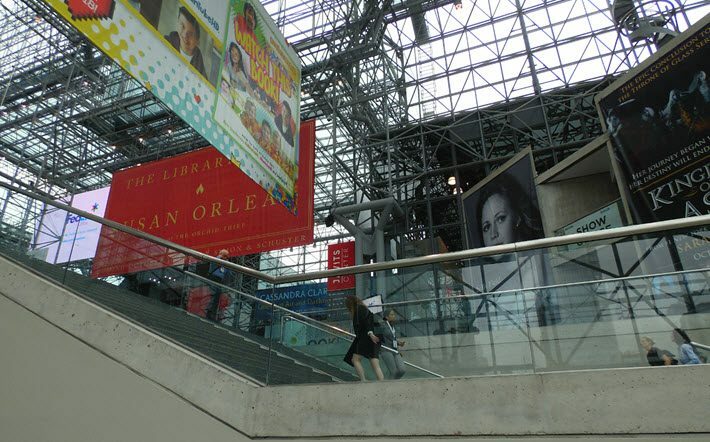 There were, the company says, 1,300 librarians in attendance at BookExpo—notice that this may have surpassed the bookseller number—and of that group, Reed says that 34 percent were first-timers. Alas, here, too, Cader reports that this year’s figure is lower, not higher, than the previous year’s. To this year’s 1,300 librarians, Cader cites 1,597 from BookExpo’s figures in 2016. As many observers quietly discussed during BookExpo week, itself, things looked thin. And now the numbers may be supporting the optics. Certainly, the programming figures sound right. The company cites 134 “conference sessions,” as they’re called, with 718 speakers. Of course some of the best programming couldn’t be seen if you weren’t at the Javits: a strong simultaneous program had been mounted two miles away at the Metropolitan Pavilion by the New York Rights Fair, the competitive rights-center event that was mounted as a rival event to BookExpo. Our latest coverage of that situation—its future still awaiting resolution—is here. And BookExpo’s infographic goes on to cite a press headcount of 1,200, an interesting figure when placed alongside the press number, 860, that Cader cites for 2016. In an era when journalists can take it on the chin for just about anything, BookExpo at least appears to be a moment when we can’t say the various media didn’t show up to do their jobs. ReedPOP reports that some 20,000 attendees went through the Javits on June 2 and 3 for the show’s public-facing BookCon event, originated several years ago by Lance Fensterman and his team. The event first reached its goal of 20,000 tickets last year. At BookCon, Reed is reporting, there were 5,600 books sold in autograph events, a parade of more than 50 “all-star authors,” and 324 exhibitors. 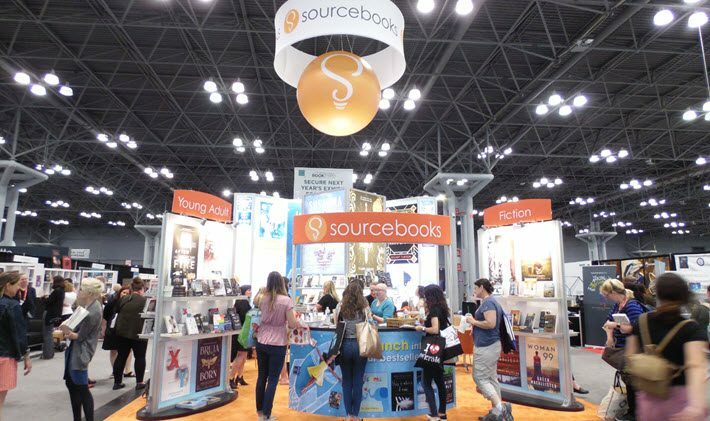 One thing that might be good to learn is how many of the booksellers and retailer who came for the “reimagining” of BookExpo stayed to observe and take part in BookCon, with its clues to the fandom that fires up a younger readership.